Beatrice Lake: Beatrice Lake is accessed via a 12 km (7.5 mi) trail up Beatrice Creek from Slocan in the Valhalla Provincial Park. Beatrice Lake is noted for its good fly fishing for rainbow trout. Cameron Lake: Cameron Lake is located west of Arrow Lake via the 40 km (25 mi) Arrow Park Creek road north from Arrow Park. A medium-size treed camping area with limited facilities and a cartop boat launch are available. Catherine Lake: Catherine Lake is located west of Arrow Lake via the 40 km (25 mi) Arrow Park Creek road north from Arrow Park. A short road from here branches east to the lake.Catherine Lake is reported as having rainbow trout of about 4.4 lbs. Champion Lakes: These three lakes are located in Champion Lakes Park. The turnoff is found approximatley 6 km (3.7 mi) northeast of Fruitvale. Follow the access road 10 km (6 mi) to the park. Rainbow trout are stocked in all three lakes and reach sizes of 2 kg (4.5 lb). Christina Lake: This lake is located just off of Highway 3 22 km (13.6 mi) east of Grand Forks. A campground with all facilities and boat launch are provided. Jewel Lake: The lake is approximately 23 km (14.3 mi) from Greenwood via 13 km (8 mi) of paved road and 10 km (6 mi) of gravel road. Camping areas and a resort are found on the lake. Kokanee Lake This hike-in lake may be accessed via the Kaslo and Joker Mill-Keen Creek roads or by the Kokanee Creek Road southwest of Balfour on Highway 3A. Yellowstone cutthroat trout are resident in this deep, cold alpine lake. Kootenay Lake This lake is over 100 km (62 mi) long with access from Nelson, Balfour, Kaslo, Crawford Bay, Boswell and several other points along Highway 31. The lake provides good fishery for Gerrard-strain rainbow trout of up to 10 kg (22 lb), Yellowstone cutthroat,large Kokanee salmon and rainbow and Dolly Varden weighing up to 12 kg (26 lb). Lower Arrow Lake This 90 km (56 mi) long 3 km (2 mi) wide lake may be accessed from Faquier, Needles, Edgewood, Castlegar or Robson. Large Gerrard rainbow trout are resident in this lake where fishing is the best in the fall months. Mirror Lake The lake is located 5 km south of Kaslo just off of Highway 31. Smallmouth bass of up to 2 kg (4.4 lb) are abundant in the lake. Nancy Greene Lake The lake is located 30 km (19 mi) west of Castlegar just off of Highway 3 near the Highway 3A junction. Power boats are not permitted on the lake. This lake is filled with rainbow trout of up to 30 cm (12 in). Slocan Lake This 45 km (28 mi) lake runs beside Highway 6 and may be accessed from New Denver, Silverton and Slocan. This lake is renowned for its large rainbow and bull trout. Fly fishing near creek mouths and trolling for kokanee are productive methods. Snowshoe Lake This lake is located just north of Highway 6 near the Needles ferry via a 5 km (3 mi) 4X4 access road. Both rainbow and brook trout are abundant in the lake and weigh up to 2 kg (4.4 lb). Staubert Lake The lake is northeast of the Galena Bay Ferry on Highway 31. A campground with limited facilities and a cartop boat launch are provided. Avid anglers try their luck for rainbow trout using either fly fishing or deep trolling methods. The lake also supports a fair population of both Dolly Varden and brook trout. Trout Lake Trout Lake is located 85 km (53 mi) north of Kaslo on Highway 31. Access is also possible from Nakusp and Revelstoke. All facilities are available at Trout Lake community. This deep, 30 km (19 mi) long lake is noted for its large rainbow and bull trout. Upper Arrow Lake This large lake may be accessed from Nakusp, Galena Bay, Beaton and numerous other areas along Highway 23. This lake is noted for its excellent large trout fishery. Species of up to 10 kg (22 lb) have been reported and Dolly Varden in the lake average 5 kg (11 lb). Whatsan Lake Access is via a gravel road north of the Arrow Lake ferry at Needles. Cabins, a camping area and boat launch are provided. Rainbow trout reaching weights of 1.5 kg (3.3 lb) as well as bull trout of up to 4.5 kg (10 lb) are resident in the lake. Kokanee are small but plentiful. 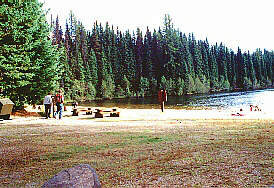 Wilgress Lake (Loon Lake): This small lake is located 22.4 km (14.3 mi) west from Grand Forks on Highway 3. provides the visitor with camping facilities, boat launch , picnic site and modern restroom facilities. Williamson Lake: This small lake is located 30 km (19 mi) from Greenwood via 25 km of gravel and dirt road. A 4X4 is recommended. A BCFS camping area and cartop boat launch are provided. Wilson Lake The lake is located 15 km (9 mi) east of Nakusp via a good logging road. BCFS campgrounds are located on the lake. This lake provides some of the best rainbow trout fishery in the Kootenays with fish of sizes up to 3 kg (6.5 lb). Kokanee is also abundant in the lake. Xenia Lake: The lake is 30 km (19 mi) north of Grand Forks on gravel road then 6 km (3.7 mi) by 4X4. A BCFS campground and cartop boat launch are provided.